Walter's boat bobbed up and down on the waves. It chugged across the harbor as it did every day. Walter held a stick in his hand. The hook on the end snagged rubbish, which Walter put in a bag and took back to shore later on. He also kept his eye open for seals and sea birds that might be hurt. Walter did a little fishing each day, hoping to catch enough to feed his family for supper. He kept a box of ice on deck to put them in. Today he had caught ten fish. His family would eat in style tonight. The next day Walter chugged out to sea. His gaze wandered to the horizon. Black clouds built against the blue sky. "A storm is coming." Even though he knew danger was looming ahead, he went in search of seals. He found one caught in a plastic bag. After cutting the plastic away, the seal swam off. Waves pounded against Walter's boat. "I'd better hurry back to shore." 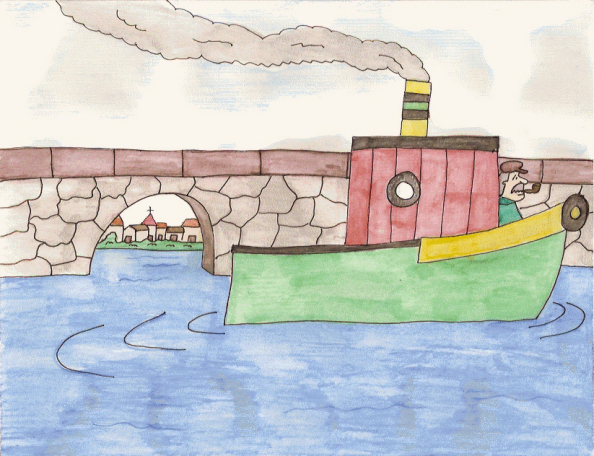 He turned the boat around and it chugged away, but not fast enough. The waves sloshed over onto the deck, soaking Walter's feet. The boat rocked back and forth and the fish slipped out of the box of ice and slid across, landing near Walter's feet. Higher and higher went the waves. Walter had to hold on to the railing. The boat started tipping over. Walter put on his life jacket. Wind blew drops of water into his eyes. Suddenly a huge wave knocked him into the water. Walter swallowed a lot of water and coughed and choked. He thought he would drown. Waves went over his head. Something bumped into his leg. "What is that?" He looked down, wiped his eyes and saw the seal that he'd helped earlier. The seal nudged Walter. He grabbed the seal's tail. It swam with him back to shore. Walter stood on the wet sand and waved goodbye to the seal. He walked home knowing his family would have no fish tonight. The next morning Walter went down to the beach. His boat sat bobbing on the waves. The storm had passed. A rope was tied to the boat and the seal held the other end in its mouth. Walter climbed into the boat and it chugged out to sea. He smiled and breathed some clean sea air and then went to look for seals and sea birds in need of his help.